We use a broad suite of tests to determine the health of individual animals by understanding their body condition. We take body measurements (lengths, girths, mass), use ultrasound to measure blubber thickness, use deuterium dilution to determine the lipid (fat) proportion of sea lion mass, and collect blood and tissue samples. We examine all of these measurements together because no single measure can indicate whether an individual sea lion is fasting, starving, chronically undernourished or well-fed and healthy. We compare these results between the endangered western population and increasing eastern population. A database of measurements from over 600 pup and juvenile sea lions collected in southeastern Alaska and Prince William Sound has helped us develop an understanding of what each of these physiological states looks like in wild populations. 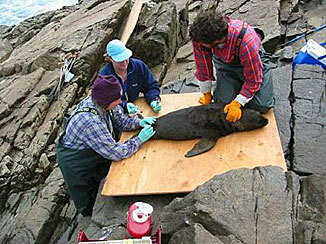 ADF&G biologists collect blood samples from a Steller sea lion pup at Cape Horn Rocks rookery in southeastern Alaska. This plot describes one measure of body increase: the increase (or loss) in body mass and fat (or lipid) mass by 20 sea lion pups captured in November and recaptured in April in Prince William Sound. This growth was highly variable, with mass change ranging from 3 – 57 kg and fat mass change ranging from 35 kg gained to 3 kg lost. Myers, Matthew J., Lorrie D. Rea and Shannon Atkinson. 2006. The effects of age, season and geographic region on thyroid hormones in Steller sea lions (Eumetopias jubatus). Comparative Biochemistry and Physiology Part A 145:90–98. Noren, D.P., L.D. Rea and T. Loughlin. 2009. A model to predict fasting capabilities and utilization of body energy stores in weaned Steller sea lions (Eumetopias jubatus) during periods of reduced prey availability. Canadian Journal of Zoology 87:852–864. Rea, L.D., M.A. Castellini, B.S. Fadely and T.R. Loughlin. 1998. Health status of young Alaska Steller sea lion pups (Eumetopias jubatus) as indicated by blood chemistry and hematology. Comparative Biochemistry and Physiology Part A 120: 617–623. Rea, L.D. 2002. Indices of condition in Steller sea lions (Eumetopias jubatus). Pages 29-33 in D. DeMaster and S. Atkinson (eds. ), Steller Sea Lion Decline: Is It Food II. University of Alaska Sea Grant, AK-SG-02-02, Fairbanks, 80 pp. Rea, L., Rosen, D. and Trites, A. 2007. Utilization of stored energy reserves during fasting varies by age and season in Steller sea lions. Canadian Journal of Zoology. 85: 190–200. Rea, L.D., M. Berman, D.A.S. Rosen, and A.W. Trites. 2009. Seasonal differences in biochemical adaptation to fasting in juvenile and subadult Steller sea lions (Eumetopias jubatus). Physiological and Biochemical Zoology 82(3):236–247. Richmond, J.P., J.M. Burns, L.D. Rea, and K.L. Mashburn. 2005. Postnatal ontogeny of erythropoietin and hematology in free-ranging Steller sea lions (Eumetopias jubatus). General and Comparative Endocrinology 141(3):240–247.